This shadow of having been a brooding man. Written in the 1970s those lines by Borges still seem applicable in today’s media soaked culture. “A Weary Man’s Utopia”, “Utopía de un hombre que está cansado” is one of the best late stories by Borges. There’s a slight flaw at the end, where Borges names a specific public figure of the 20th century, that lessens the impact of the story. Of course, others might read that flaw as the story’s strength. The narrator is traveling across a vast plain, the open countryside, where he encounters a very odd, tall person that can only speak to him in Latin. Ã’m purposefully leaving out some details since part of the enjoyment of this particular story is slowly understanding its setting. There’s one point in the story where I laughed out loud, not something common for a Borges story. The narrator, who has taken an identity similar to the actual Borges, describes himself as one who writes stories of fantasy. The tall stranger says that he has read two books of fantasy: Gulliver’s Travels and Summa Theologica. This is a world where there are no printed books. Printing has been forbidden since it is “one of the worse evils of mankind, for it tended to multiply unnecessary texts to a dizzying degree”, ha sido uno de los peores males del hombre, ya que tendió a multiplicar hasta el vértigo textos innecesarios. As with other of his later stories, Borges is very explicit in what he is telling us, such as “it is not the reading that matters, but the rereading (emphasis mine), Además no importa leer sino releer. This world gets bleaker with the more that the narrator learns. Unfortunately, I think that the story breaks down a little towards the very end with the flaw I mentioned previously. Regardless, it is a very powerful story with a lot of insights that can be applied to concerns facing our society today. Without giving away the relevant context here, I do want to mention that there’s a wonderful line where the narrator says, “Every man must be his own Bernard Shaw, his own Jesus Christ, and his own Archimedes.” Cada cual debe ser su propio Bernard Shaw, su propio Jesucristo y su propio Arquímedes. That gem of a line is from an obscure essay by Borges on one of the most striking episodes in The Divine Comedy: Dante’s encounter with the lovers Francesca and Paolo, who are condemned to be tossed about in a windstorm in the second circle of Hell for their adultery. Beatrice existed infinitely for Dante. Dante very little, perhaps not at all, for Beatrice. All of us tend to forget, out of pity, out of veneration, this grievous discord which for Dante was unforgettable. I think of the two lovers that Alighieri dreamed in the hurricane of the second circle and who, whether or not he understood or wanted them to be, were obscure emblems of the joy he did not attain. While paintings over the years often depict Paolo and Francesca embracing, I prefer to imagine the alternate image of the couple as being tossed separately about on the winds, forever in sight of one another, being thrown close together but then continually pulled back by the winds just before touching, eternally out of reach. I can no longer think about this story without remembering last year’s remarkablefuerzabruta show in Buenos Aires. There was a segment depicting a man and a woman positioned on either side of a large rotating disk suspended in front of the audience. Amidst the sounds of a storm, the rotating disk moved faster and faster as the couple tried vainly to reach each other. While I’m not sure if it was intentional, I thought immediately of Paolo and Francesca when I saw the performance….Dante is all around. These days most people don’t read long epic poems for the fun of it, but it’s worth giving Dante an attempt if you haven’t already. And if you’re a lover of literature, then you must. In English an entire industry has developed around the translations of The Divine Comedy. The one that seems most popular now is by Ciardi. There are some older, now free, translations on the net but the language and syntax is dated and probably shouldn’t be one’s first encounter with Dante. I’m not sure about the translations in Spanish. Even the first president of the Argentine republic Bartolomé Mitre translated Dante into Spanish during the 19th century. But, I’m sure that there are better versions but I’m not able to recommend a specific one in Spanish. It seems likely that the original Italian translates better into Spanish than English. Regardless of the language, try to select a version in verse since The Divine Comedy is a poem. If possible, it’s good to have a version with both the Italian and the translation on facing pages but it’s not a necessity. Tomorrow, I’ll continue with some more comments by Borges on The Divine Comedy. Todo sucede por primera vez, pero de un modo eterno. El que lee mis palabras está inventándolas. The books in the library have no letters. They spring forth when I open them. Everything happens for the first time, but in a way that is eternal. Whoever reads my words is inventing them. On their way to the party yesterday in Plaza de Mayo a number of buses came by the apartment. 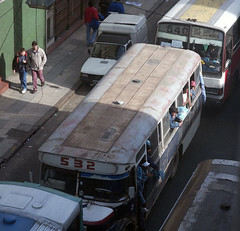 The photo shows a line of about a dozen buses from Lomas de Zamora. There’s some controversy about the event. It was clearly a pro-Kirchner political rally paid for by the government. Of course, the incumbent always has a lot of benefits. According to the news, these bus trips for yesterday’s event were subsidized by the government. Just to underscore that it was a political rally and not a celebration of the national holiday, a large part of the crowd left just after Kirchner’s speech and before two of Argentina’s most well-known (and best) singers – Victor Heredia and Mercedes Sosa – performed. Evidently, it was time to get back on the bus. In the 1975 collection of poems LA ROSA PROFUNDA/AN UNENDING ROSE, there are two short poems by Borges, appearing on the same page, that should be read together. The first poem is titled “Soy” [I am]. The second is titled “Un ciego” [A blind man]. SOY ends with the line “Soy eco, olvido, nada.” [I am echo, emptiness, nothing]. Today is Independence Day in Argentina. La Patria was very important to Borges, though he usually wasn’t in agreement with the popular governments. More on that in another posting. Borges wrote a poem, “Página para recordar al coronel Suárez, vencedor en Junín”, in memory of one of his ancestors who led one of the last battles for independence against Spain on August 6, 1824. Borges writes in the poem that the battle was only with swords and lances, “not a single shot fired”. I don’t know if that’s historically accurate but it would be interesting, in terms of military history, for a battle at that time not to have gunfire. for an examination, or a place in the atlas? the pomp of actual armies and of trumpets. or an unknown man somewhere, dying in prison. o un hombre oscuro que se muere en la carcel. Paul Auster has long been one of my favorite writers. Evidently, he’s also a favorite among readers in Buenos Aires. Last Sunday’s PERFIL newspaper listed Auster’s latest novel to be translated into Spanish, The Brooklyn Follies , as the number 3 bestseller in the city. Auster is one of the few U.S. writers who writes with an imagination that is similar to many Argentine writers. Attesting to his popularity here is this photo from a Jumbo store ad for a set of plastic containers, which appeared as an insert to the newspapers. Look closely at the containers in the ad and you will see some books. Normally, books in these kind of ads are generic editions. But, this one features two books by Paul Auster: Oracle Night and Mr. Vertigo …. probably a sly homage from a photographer. One of the reasons that I’m writing this series is to introduce readers to Borges. I’m not writing for literary scholars; I have nothing new to add in that category. Many have heard of Borges, a lot have read Borges, most have not despite Borges being one of the great writers of the 20th century. And that’s where today’s post comes in. I want to dispel the image of Borges as the blind, wise elderly sage. While Borges wrote during his entire life, there are definite phases to his writing career. Many people might be surprised to learn that Borges didn’t really begin writing fiction until his thirties, and not successfully until his late thirties. Writing is a craft developed over time, with a lot of practice. Even Borges didn’t emerge from the womb fully-formed as a writer. Indeed, Borges didn’t become internationally famous until his early sixties, some twenty years after his best fiction was published. 1920s – Borges focused on poetry and essays. His poetry of this period is very sentimental, formal and usually deals with mythological aspects of Buenos Aires – gauchos, knives, cobbletone streets, etc., The poetry of this period is not as refined as his later verse. In the ’20s he also wrote three books of essays, which he later would not allow to be reprinted during his lifetime. Some of those essays are not that bad and there are several theories in the scholarship as to why he didn’t want the essays to be republished. During the ’20s he was also involved in the avant-garde scene that was very active in Buenos Aires. 1930s – Borges stopped writing poetry around 1930. The Williamson biography posits that Borges experienced a crisis over his unrequited love for the writer Norah Lange. (A lot of people criticize the Williamson biography since it portrays Borges as a lovesick puppy. I don’t know, but any guy who spends his entire adult life living with his overbearing mother probably has difficulties in the romance department.) During the ’30s Borges started to experiment with fiction, publishing the odd collection A Universal History of Iniquity in 1935. He also wrote some significant essays. 1938 was a critical year for Borges. His father died. And Borges suffered a near fatal accident which confined him for several months. When he recovered, he started writing fiction vigorously. 1940s – These were the most productive years of his writing career, producing the fiction for which he is most famous. THE GARDEN OF FORKING PATHS [El jardín de senderos que se bifurcan] was pubished in 1941, containing eight stories. ARTIFICES [Artificios] was published in 1944, containing nine stories. These two collections were published together in December 1944 under the title FICCIONES. In 1949 EL ALEPH was published, containing seventeen stories. He also continued to write essays in the ’40s but no poetry. Despite his publications, Borges remained unknown outside of Latin America during the 1940s. 1950s – Borges stopped writing fiction in 1952 and returned to poetry. He continued with the essays but no other stories would appear until the 1960s. In 1951 a French translation of FICCIONES was published. In 1952 a French collection of stories by Borges was published under the title LABYRINTHES. In 1955 his long, hereditary struggle with his poor eyesight resulted in blindness. Throughout the 1950s more works by Borges were translated into French. By the end of the decade, most of his writings were available to the French literary community. His works were also translated into Italian and German. Borges was still unknown in the English-speaking world. 1960s – Borges returned to writing stories. For the remainder of his life he would compose stories and poetry by dictation. He gave a number of lectures that were transcribed. In 1961 Borges was the co-recipient of the International Publishers Prize, which he shared with Samuel Beckett; the English reading world sat up and took notice. FICCIONES was published in English in 1962, DREAMTIGERS [El Hacedor] in English in 1964, LABYRINTHS in 1964 in English. Other collections by various translators appeared throughout the sixties and seventies, most by Norman Thomas di Giovanni who collaborated with Borges on the translations. Borges spent a significant amount of time in the 1960s traveling, with his very old mother, in the US and Britain, speaking at various universities. The point of the chronology is to show that Borges was not always the famous writer that he is today. He lived most of his life in obscurity. He was fortunate to live long enough to appreciate his fame. Should make you wonder what great writers you’re missing now in 2006.